Synopsis: Jove Deadly is a bloodhound with a rundown detective agency on the moon, but a new case has Jove thinking he only has a nose for trouble. 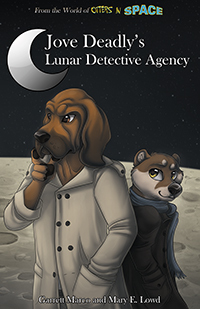 When a poodle saunters into Jove's office and hires him to find her missing fiancé, he doesn't expect the missing dog to be his own ne'er-do-well brother, Aries Deadly! Another day, another mystery. But whenever the Deadly family gets together, there's bound to be trouble. 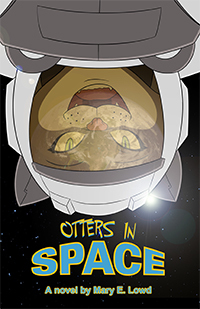 Jove and his otter sidekick, Roen, have to work together with Tara Deadly to investigate a stable of unsavory and would-be pillars of the scientific community to track down a bit of First Race technology—and their own payday. Will Jove and Roen be able to reunite the lost lovers? Can Jove stand working with his far more successful sister? As long as the money's good, Jove Deadly can make it work. This double-story book contains two exciting, DEADLY mysteries that will take you from an amusement park on the moon to a chase across Earth! Don’t miss out, and maybe bring along some rawhide chews to share with the detective.